This video is hilarious. While their plan might stimulate consumer spending I worry that it would lead to more vacant apartments around the country. Enjoy! The million dollar question on just about every investor’s mind right now has to do with whether the US is headed for massive inflation, crippling deflation, or some even more insidious combination of both. I have a news flash for everyone contemplating the answer to this question: no matter how much data you scrutinize, no matter how many very intelligent and articulate people agree with you, no matter how right you have been in predicting the evolution of this crisis, no one knows for sure. In situations such as this I like to quote PIMCO Co-CEO Mohamed El-Erian. When asked to make a specific forecast or prediction about the markets or economy, he unabashedly says, “The intellectually honest answer is I don’t know.” Of course, El-Erian and Bill Gross have spent the last few months writing and speaking about their concept of a “new normal” in which American consumers and investors are forced to realize that going forward things won’t be like they were during the credit bubble. Though this may seem like blind forecasting, from my perspective there is something more genuine about trying to anticipate major structural changes in the economy than making proclamations of what GDP growth (or lack thereof) will be in Q4 2009. My honest view is that the situation is too dynamic and has too many variables for anyone to accurately predict how the inflation-deflation debate will eventually play out. None of us have crystal balls. While I sometimes suspect that John Paulson has either developed some form of future predicting device or a time machine (how else can you make $5.7B in two years? ), the truth of the matter is that humans are not good predictors. Any data you look at, whether it is handicappers forecasting the winners of horse races or analysts estimating quarterly/yearly earnings per share for a company, indicates that these predictions are often substantially off the mark and any success likely has more to do with luck than anything else. Despite the mountain of evidence that suggests that our predictive ability is no better than that of a coin flip, every day investors are bombarded with economic, market and company specific forecasts. I guess in some way it is a coping mechanism. In a very uncertain world people look to experts to offer guidance regarding what the future will look like. My personal strategy is to read as much as I can on the subject and pay special attention to material that is contrary to what I would be inclined to believe. Specifically, understanding the other side of any debate is crucial for investors. The best question an analyst can ask himself or herself is “where could I be wrong?” It is only when you understand the potential upside and downside of an investment that you can invest with confidence, assuming you have built in an appropriate margin of safety. It is within the context of evaluating both sides of the inflation-deflation debate that I stumbled on two articles from two well-respected economists, both published on the New York Times website. On May 28th, former IMF chief economist Simon Johnson articulated his fears about looming inflation and on May 29th, Nobel Prize winning economist made his persuasive case for impending deflation. Now, I am still relatively new to the investing game and this is my first financial crisis, but I am continually struck by the fact that two ostensibly knowledgeable people can look at the same set of economic and monetary facts and come up with seemingly divergent opinions on what the future will look like. Not only that, but for a novice economist like myself, both make compelling enough cases that I almost feel comfortable believing both of their arguments simultaneously. 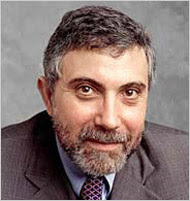 Briefly, Krugman argues that there is little sign of inflationary pressure in the US right now. He dismisses the idea that rising Treasury rates imply that we are on the precipice of hyperinflation. His take is that it is a misperception to believe that inflation is inevitable just because the Fed is monetizing the debt and printing money. While that may be true in ordinary times as banks would theoretically lend that money out, the fact that banks are actually just holding the money as reserves means there is very little money actually being added to the financial system. He then cites the Japanese experience as evidence that prices can continue to fall even when the government is purchasing its own debt. In conclusion, he believes that deflation represents the more proximate danger. On the other hand Johnson believes that the Bernanke-led macroeconomic orthodoxy that is desperately trying to avoid deflation has been very wrong over the past two years and cannot necessarily be trusted. His claim is that the Fed’s pumping of money into the system can still cause inflation even if unemployment remains high and there is still a lot of slack in the system. The inflation he foresees is not wage inflation, but commodity inflation exacerbated by the attempts of investors to hedge a continually falling US dollar. This is headline inflation but not the core inflation that the Fed focuses on. Unfortunately, for people who have to fill up their gas tanks and buy groceries this is a very real threat. The ultimate concern is that the Fed will not be able to turn off the spigot in time or feels constrained to keep interest rates low in order to prevent the economy from dipping back into recession, events that cause inflation to surpass 5%. While that does not on its face sound like much, keep in mind that 5% inflation implies a loss of 50% of purchasing power in just ten years. Not quite Zimbabwe but also not something we really want. So, what is my take on all of this? While it may appear that that both scenarios presented above could not play out simultaneously, it occurs to me that that they are not necessarily mutually exclusive. My fear is that we actually are facing a scenario of financial asset deflation (stocks, real estate, etc) and commodity price inflation (gold, oil, agricultural goods) combined with either stagnation of GDP or negative GDP growth. I am not even sure if there is a word for such a thing bit I guarantee it wouldn’t sound pretty. With unemployment continuing to spike we are by definition already seeing aggregate wage deflation but in a more scary scenario that could be supplemented by the wages of working people contracting (obviously not on Wall Street though) due to the supply glut of unemployed workers and reduced aggregate demand (this of course depends on the inherent stickiness of wages). If you combine financial wealth destruction, cost of living increases, and falling wages, we could be in for a nasty few years. While this is a pretty draconian scenario, my advice to my investing brethren is to not get anchored to one side or another of the inflation-deflation debate. Try to keep an open mind and search for investments that protect you from downside in either case. In such an uncertain time capital protection should be paramount because the honest truth is that we won’t know how it all went down until we have the benefit of hindsight. As if the banks hadn't already taken advantage of the government and taxpayers enough, the news broke today in the Wall Street Journal (http://online.wsj.com/article/SB124338836675757049.html#mod=testMod) that the banks are lobbying in Washington to be allowed to take part in PPIP. For those of you unfamiliar with this particular alliterative acronym, the Public Private Investment Program is a taxpayer funded scheme to help banks get toxic assets off of their balance sheets so they can start lending again. Sounds innocuous enough, right? Well, that is until a diligent taxpayer (meaning someone who is not trying to be a member of Obama's cabinet) scrutinizes the details of the Legacy Loan PPIP. I should note that the announced terms of the Legacy Securities PPIP are slightly different but I am focusing on the Legacy Loan PPIP (consisting of whole loans such as residential and commercial mortgages) because it is the one the banks are apparently interested in taking part in. Here is the basic structure: the Treasury and a "private investor" team up to provide equity for the purchase of assets that a bank is holding on its balance sheet. The example that the Fed uses is based on $100 worth of assets being auctioned off by the FDIC. Assuming that the winning bid was $84, the Treasury would put up $6, the private investor would put up $6, and the FDIC would provide a non-recourse loan for $72, effectively a 6:1 leverage ratio. From there the private investor would supposedly hold the assets with the hope that they increase in value as the economy recovers and the market for these assets becomes more liquid. In the event the assets were sold at more than $84 at some point, the Treasury and the private investors would share in any profits. If, however, the price of the assets declined further the private investor would have the option to walk away only losing the initial $6 and sticking the taxpayer with any losses beyond that. Now, aside from my original concerns about whether this program is fair to taxpayers or will even work, I see two new potential deal structures that bring about a whole slew of conflicts of interest. First off, is the banks buying the assets of other banks. Let's say you are Citigroup (C) and you have $100M in loans that you would love to get off your balance sheet. What you do is call your buddy at JP Morgan (JPM) and invite him to lunch (making sure not to discuss any of your plans on the phone or over email) and propose a transaction. Here is how it would work: I will tip you off about the $100M in loans I am about to put on the auction block. These are not my absolute worst loans that are likely to be worth pennies on the dollar because I don't really want to fleece you. But these are loans that have very skewed outcomes, meaning that in the unlikely scenario in which the economy recovers to the extent that these loans actually perform, they would be worth a lot. Under a more realistic scenario these loans retain most of their depressed values and eventually the sale is a wash. But even if the economy got much worse and these poorly underwritten loans turned out to be worth much less than they were marked and sold at, all the purchaser could lose is the miniscule equity investment. Let's look at what Citi gets out of this. To make the example simple I am assuming that JP pays $84M for the assets: $6M of its money, $6M of the Treasury's money, and $72M from the FDIC's loan. If Citi had the assets marked at $75M, for example, it would book a $9M gain and get them off its balance sheet and be able to either delever or use the money to make new loans at very attractive spreads. Wait a second though, why would JP agree to be involved with this? The first reason is that I am assuming that JP would not be buying these assets to put them on its balance sheet. It would create some off balance sheet special vehicle and fund it with the $6M to complete the transaction. I am aware the FAS 140 is coming and banks may be forced to take certain off balance sheet vehicles onto their balance sheet if they have not been deemed to have given up control of the assets. So that could complicate things a little. But not enough to derail the scheme because this is only part of the transaction. In return, I envision Citi doing the same thing for JP: overbidding so JP could get some relatively toxic assets of its balance sheet, book a gain, and be free to lend that new money out. It could all be done with a wink and a nod. To make it even less obvious 10 banks could secretly get together and agree that Citi will buy JP's assets, Goldman will buy Citi's and so on. The FDIC's guarantee puts a floor under the value of the assets regardless of any turmoil in the economy or regarding the consumers and businesses who took on these loans. If the banks were allowed to do this it would be like a game of musical chairs where even when the music stops the only one without a chair is the FDIC and the taxpayer. The banks just keep on playing. The other potential (and even more egregious) conflict of interest would come about if somehow the banks were allowed to bid on their own assets. Maybe I give the government way too much credit, but I assume that this is very unlikely to be permitted. The idea that the banks could set up an off balance sheet vehicle, bid on their own assets with taxpayer funded capital, and get them off their balance sheets with an underlying put option is absolutely ludicrous to me. One of the major problems that caused this financial crisis was banks' use of off balance sheet vehicles and the lack of transparency that was inevitably created. As a result, I don't see how promoting less transparency and allowing the banks to bid against themselves in a transaction that obviously is not arm's length helps solve anything. Let us all hope and pray that the powers that be see this conflict of interest and tell the banks they cannot participate in PPIP with a resounding "No!" I also think it is informative (and somewhat humorous) to take a look at what people initially thought of the proposal to let banks take part in PPIP. 1. "Banks may be more willing to accept a lower initial price if they and their shareholders have a meaningful opportunity to share in the upside," Norman R. Nelson, general counsel of the Clearing House Association LLC, wrote in a letter to the FDIC last month. I guess the theory here is that the banks would be willing to sell their own toxic waste at a lower price if they also had the opportunity to buy someone else's radioactive sludge at a commensurately low price with the hope of making a multiple on their investment. What this ignores is that due to the leverage provided by the FDIC and the clubby (slash collusive) nature of the banks there is actually an incentive to overpay and stick the taxpayer with any losses. 2. "To allow the government to finance an off-balance-sheet maneuver that claims to shift risk off the parent firm's books but really doesn't offload it is highly problematic," said Arthur Levitt, a former Securities and Exchange Commission chairman who is an adviser to private-equity firm Carlyle Group LLC. You can always count on Arthur Levitt to provide some reason within a completely irrational environment. As an aside, I happen to believe that if he had been the head of the SEC instead of the infamous Chris Cox things would be very different right now. 3. "The notion of banks doing this is incongruent with the original purpose of the PPIP and wrought with major conflicts," said Thomas Priore, president of ICP Capital, a New York fixed-income investment firm overseeing about $16 billion in assets. No, really? Thanks Thomas. I just hope the feds see this as clearly as you and I do. 4. "Sensible restrictions should be placed on banks, especially those that have received government capital, from investing their own balance sheets in a backdoor effort to reacquire what could be their own assets with an enormous amount of federally guaranteed leverage," said Daniel Alpert, managing director at Westwood Capital LLC, an investment bank. Mr. Alpert reminds us that many banks took government capital in the form of TARP money and continue to issue debt backed by the FDIC so that they can boost their capital reserves and reduce leverage. Somehow adding more dodgy assets on a levered basis seems to defeat the purpose of shoring up our financial system. 5. "A bank bidding on its own assets really has the potential to look awful in the public's mind," said Mark J. Tenhundfeld, an American Bankers Association lobbyist. Even the banks' lobby understands how the public might see this self-dealing as slightly problematic. But it never hurts to ask! 6. The California Bankers Association said in a letter that the FDIC's supervision of the asset-pricing process "should alleviate concerns about the inability to effect arm's length transactions between a bank and its affiliate that purchases through a public-private investment fund." FDIC supervision? You mean that we should trust the regulators to be able to protect the taxpayers? I think the recent track record of the Fed, the SEC, and the OTS make it very clear that these entities are incapable of regulating the banks properly and monitoring systemic risk. In conclusion, I think it is painfully obvious that the banks' involvement in the PPIP in any form brings up a number of conflicts of interest and presents a very real possibility of collusion. I don't see any way in which the taxpayer benefits from the banks getting more free lunch. While the banks proposal to be included is somewhat nebulous (since I am just relying on the WSJ article as source material), it seems to me that any manifestation would only serve to make the current financial crisis even worse. But what frightens me even more is that after everything that we have been through, from Bear Stearns to AIG to TARP, the banks would have the audacity to ask for more handouts. My hope is that one day public sentiment becomes so negative that the leaders of these institutions no longer are able to play the government and the taxpayers for fools. As many of my readers know, I have been intimately involved in the regional banking sector for close to two years now. During that time I have seen the management of these banks go from bullishness, to denial, to despair, and most recently to cautious optimism. It is in the context of this recent optimism regarding the regional banks and the entire US financial system that I thought I should offer a sobering reminder of the potentially devastating impact of not fully appreciating the severity of this credit crisis and economic downturn. Last May at the annual SunTrust "Unconference" in New York City I met the management teams of BankUnited (BKUNA) and BankAtlantic (BBX), two Florida-based banks with large exposures to the Florida real estate market that was quickly deteriorating. At the time both of the companies' stocks were trading at less than 35% of tangible book value and were at least 80% off their 52 week highs. Just like today, capital raising opportunities were the main topic of discussion due to the fact that both companies had non-performing loans at or above 4% of total loans. Also, with the value of Florida residential real estate falling virtually by the minute, investors were obviously concerned with BKUNA's $9.7B and BBX's $2.1B residential mortgage portfolios. However, despite similarly adverse circumstances, the tone of the discussion was very different between the two companies, a fact that I think provides a very relevant and pertinent example of the risk of unfounded optimism. "Things seem to be really bad in their footprint. They completely disagreed with BKUNA’s take on the Florida market. There is no question they are going to have to raise dilutive capital just to survive. It doesn’t look like they have any other levers to pull aside from a 100% dilutive equity raise. Their loan portfolio should continue to deteriorate as land/home values fall, more borrowers default, they continue to write down home equity loans and their homebuilder exposure gets nastier." During the discussion, the company seemed to be taking a very realistic look at the current real estate environment in Florida. COO/SVP Lloyd DeVaux readily admitted that things in Florida were not getting better, not even in markets where people expected things to be improving. He commented that the Orlando market was still very weak and said that the Ft. Myers market wouldn't come back for years. As a result of widespread re-appraising of real estate, he claimed that BBX had begun to aggressively put loans on non-accrual and increased loan loss provisions, actions that would inevitably force the company to raise capital. In other words, given what was going on in the company's markets the management team was taking a very sober point of view. Now, we have to contrast BBX's outlook with that of the recently-failed BKUNA. During the discussion with analysts, former CEO Alfred Camner focused on the positives. With a straight face he told us about BKUNA's strong deposit base within what he actually called a "vibrant" economy that had a lower unemployment rate than that of the nation as a whole. He also discussed the strength of the import/export market and explained the attractiveness of South Beach as place to live. What this meant was that BKUNA had the strongest franchise in Florida, a state that was still an attractive place to live and do business. I understand that one of the jobs of a CEO is to put a happy face on and sell the company to potential investors. However, everyone in the room knew what was going on in the Florida real estate market. What we were looking for was a realistic assessment of the circumstances and what we got was the impression that this management team was completely out of touch. "In this case the management was very defensive and did not appear anywhere near as defeated as the management at BBX. They were trying to make the case that the stock was extremely undervalued based on their current loan book exposure. Sitting there I couldn’t imagine how two companies with similar footprints could have such different views... However, nothing can change the fact that close to 80% of their portfolio is in residential mortgages in a state where house prices have dropped precipitously. Also, the percentage of low doc and no doc loans is very troubling. Obviously this is another candidate to go to $0 eventually or raise massively dilutive common equity." Whether or not the BKUNA CEO believed what he was telling us, I think there is lesson for investors here about assessing the quality of a management team and being skeptical of what appears to be misplaced optimism. While Camner did acknowledge that the company would likely have to raise capital, you can't help but wonder if the entire management team was somewhat blinded by the idea that Florida was (and maybe still is) a state that would benefit as the population of the US continued to move into the warm weather states. In contrast, the fact that the BBX management team was more focused on the potential downside may be one of the reasons the company is still independent. There is no question that BBX could also go away eventually, but for my investment dollar I would much rather bet on a company run by jockeys who not only carefully and conservatively evaluate the horse, but also the race track. So, what does all of this mean about investing right now? Fast forward to this past Wednesday when I again found myself navigating the famous SunTrust Unconference. While there I had a chance to visit an old friend from Florida, Seacoast Banking Corp. of Florida (SBCF). SBCF is another single digit midget (a stock trading at under $10) that has been battered by the Florida real estate collapse. The company unfortunately had decided to make a number of real estate construction loans during the boom period that CEO Dennis Hudson described as being a disaster for SBCF. However, what was really interesting and troubling to me as I try to assess how long and how severe this recession is going to be were his comments regarding the current state of affairs in the SBCF footprint. Specifically, Mr. Hudson told us that Florida has reached the point in the cycle in which the formerly concentrated problems of the residential construction sector are now starting to spread to the rest of the economy. From the beginning of all of this I had asked myself the same questions. What happens to the numerous commercial strip centers that were built alongside new residential developments in anticipation of each unit being sold? Can those businesses survive if those developments turn into ghost towns due to foreclosures or demand that never materialized? I think we now have an answer to that question. The contagion effects and the overall recession have started to cause vacancies in retail. What started in the industrial and warehouse portion of the commercial real estate (CRE) space has now begun to hit mom and pop stores and strip centers. Accordingly, while he did say that he was seeing clear signs of stabilization in the housing market, Mr. Hudson indicated that SBCF is very concerned about its CRE portfolio. In conclusion, while I certainly appreciated Mr. Hudson's candidness and think SBCF will be a survivor in all of this, I am definitely not rushing out to buy shares just because he gave us a realistic assessment of the economic circumstances in Florida. In fact, I worry that what is happening in Florida is going to start happening in the rest of the country, especially in the areas where the housing markets have taken the biggest hits. I continue to have a negative outlook on the regional banking sector as a result of my opinion that loans for CRE and C&I (business loans) will start to go bad at higher rates and force even more charge offs and provisioning at the banks. Maybe my stance will change when I meet a management team that is optimistic for what look like realistic reasons. But, until then I will be waiting patiently on the sidelines. Change in Holdings of Paulson and Co.
How will we know when things have really turned?